Let’s also be clear about Hamas: their charter reflects some very serious anti-Semitism as well, and this cannot be removed from their day-to-day ideology as it guides their actions and violence. But it also cannot, if we wish to understand Hamas, be seen as the prime motivator for their acts. There have been more than a few times this has cropped up: Husseini’s alliance with Hitler; the PLO’s denial of a Jewish historical connection with the land of Palestine/Israel; Hamas’ charter and other examples. And each of them has caused enormous damage to the Palestinian cause and served as justification for Jewish fears. But they cannot be allowed to completely mask the real grievances Palestinians have, the real history of dispossession and suffering. Nor can these examples be allowed to overwhelm the vast majority of Palestinians who want nothing more than to live their lives with some degree of hope and dignity. 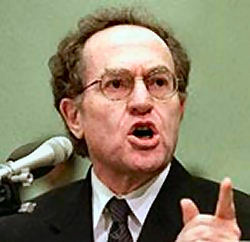 Dershowitz’s demagoguery knows no bounds. His extrapolation of Husseini’s venom to cover the whole of Palestinian society is stretched further to exploit the revulsion and fear that Ahmedinejad’s hateful words create. So, Husseini was Hitler, and Ahmedinejad is Hitler, and Khlaed Mesha’al is Hitler…there are a lot of Hitlers in Dershowitz’s world. In the real world, though, there was one Hitler, and, after he caused unimaginable death, destruction and suffering, he was ultimately defeated. But the wounds he produced stay with us. As Avraham Burg, the former speaker of the Knesset, described so eloquently in his book, The Holocaust Is Over: We Must Rise From Its Ashes, (which had a much more eloquent title in Hebrew, L’Natzeach Hitler, Defeating Hitler), the Jewish people have not overcome the trauma of the Shoah. That is a problem we, as Jews, need to deal with, but it is also a wound that Dershowitz pours salt on. In his rant, there is no recognition of the suffering of the Palestinians, no acknowledgment of the injury and terrible burden of living under a military occupation, with no rights, for almost 42 years now. There is no acknowledgment, whomever one holds to blame, of the hardships and tragedies of Palestinian refugees for 61 years and for the massive loss of life and property among Palestinians over the many years of this conflict. Dershowitz thus becomes the Jewish mirror of Ahmedinejad, who denies or ignores in the very same way the horror of the Holocaust and supports the continued attacks on Israeli civilians. Surasky’s description of Dershowitz as a bully is very apt. This is a man that has advocated the destruction of entire Palestinian villages in response to attacks on Israelis. He is a lawyer to whom international law means nothing and an individual who has espoused the most ethically perverted notions. Various Palestinian leaders, to be sure, give Dershowitz great tools to work with. But the conflict, and for the last 42 years, the occupation, creates hatred. That’s what happens when two ethnic groups clash for a long period. Hatred of Arabs is not difficult to find among Israelis and Jews worldwide and the response-“It’s because of what they do to us”-is the same one the Palestinians use. Dershowitz pounces on the inevitable hatred that arises in conflict and spreads it around to cover all Israeli misdeeds. Hamas does the same in reverse. The organizers of Durban II made a great many efforts to prevent the Israel-Palestine conflict from again overwhelming its broader work. Those efforts, in many cases angered and disappointed Palestinian delegates to the conference. And then they were all undermined by the monumentally stupid decision to allow Ahmedinejad to speak. Dershowitz’s characterization of the conference as a “hate-fest” was false and intended to ensure that the grievous (and, frankly, ethically wrong) error in allowing Ahmedinejad a forum was a fatal one. It was probably overkill. Demagogue #1 had already killed any hopes the conference had of overcoming the shadow of the 2001 conference. Demagogue #2 simply showed everyone that mindless hate is not only to be found in those claiming support of the Palestinians but also among the misguided souls whose support for Israel is blind and hate-filled. Dershowitz’s message is that there is no hope for resolution of this conflict because the Palestinian/Arab agenda is not political, it is genocidal. That’s a message everyone who cares about Israel must combat. It’s demonstrably false, it is pure bigotry and the fact that it continues to hold sway among many is a major obstacle to progress in resolving this bitter conflict. This entry was posted on April 24, 2009 at 11:32 am and is filed under Uncategorized. You can follow any responses to this entry through the RSS 2.0 feed. You can leave a response, or trackback from your own site. Perhaps the only thing left unsaid is that, while the Israeli fear of genocidal Arabs has realistically been left in history (no, I don’t believe Iran is planning a sneak nuclear attack on Tel Aviv), the new Israeli goverenment should raise a realistic fear of genocidal Israelis (to wit: Gaza). Either way, as you say, there’s little hope for resolution of this conflict. Since when was a complete lack of knowledge on Arab-Israeli affairs a barrier to pontificating on the subject. Said has zero expertise on Middle East History as he amply demonstrated in every single one of his books. Neither does Tony Judt but the FT felt he was a proper person to discuss Sands book – Sands who also has no expertise in the field he was writing a book about. Finkelstein, Quandt and others can’t manage even the basics of any of the languages they pontificate on. I doubt Pappe can even spell archive now days. If we held people to the standard of actually knowing what they talked about and some basic factual accuracy, I suspect those remaining could be counted on the fingers of both hands and that wouldn’t be a bad thing at all. PS the thing that annoyed me about Dershowitz’s first book was the basic factual errors – like having Spring of Youth occurring in 1982. I never read the others.